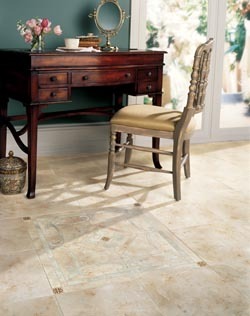 Show off your home by installing stunning new tile flooring in your rooms. Ceramic, porcelain, or slate tile floors are excellent ways to improve the look, feel, and lasting appeal of your space. Explore your tile flooring options at our large warehouse showroom. We offer the broadest selection of sizes, shapes, colors, and textures of tile all under one roof. Tile is an affordable and quick way to enhance the atmosphere of your home's interior. From sleek and modern to rich and classic, you'll explore the widest selection of floor tiles from high quality-brands that never disappoint. Add a new, durable surface that perfectly matches your unique sense of style. Beyond its lasting durability, incredible versatility, and extraordinary beauty, it is also very easy to clean. On-going maintenance is the key to keeping your floors looking their best for several years to come. Best of all, you don't need to keep buying expensive cleaners and specialty products. Just a simple broom, mop, and water should be enough to suffice. Floor cleaners may be used occasionally to remove stubborn dirt. Enjoy exceptional-quality floor while staying within the parameters of your budget by choosing ceramic tile. Thanks to its famous versatility, you're free to install it in a variety of areas throughout your home or place of business, including places where water and spills are frequent. This makes ceramic tile ideal for places such as bathrooms and kitchens, as well as patios and living room areas. Appropriate for causal or formal settings, porcelain tile remains among the most design-friendly materials on the market today. Make your flooring dreams a vivid reality by taking advantage of the many features that porcelain provides. Furthermore, you have the ability to create nearly endless designs throughout your home with accents and trim pieces that complement your home décor. The results are simply stunning. Go in a different direction with slate! The extraordinary quality you receive from this flooring option is remarkable. Strong, stain proof, and waterproof, slate tile carries a distinct natural beauty that stands out among other flooring options. It is both classy and rustic. You don’t have to use slate only on your floors either. Instead, it is an extremely viable option for your walls. Thanks to its properties, many customers choose to install this type of flooring in and around areas with high water such as around the pool or the driveway. Though tile is among the easiest and fastest materials in the industry to install, having certified experts perform the job ensures outstanding and lasting results that you'll cherish for a lifetime. Our commitment to unmatched service doesn't end once you've selected your tile. Turn to us for tile flooring installation as part of our comprehensive service. Why run the risk of a less-than-superior installation for your tile? Instead, rely on our dedication to perfection and experience to do the job right the first time. From the moment we arrive until the second we leave, our crew provides exceptional customer service and installation work from beginning to end. Get all of your questions answered and feel confident buying your new floor when you work with our knowledgeable associates. Each of our highly trained team members know virtually everything about the various types of tile flooring and the brands we carry. Top-tier customer service always remains among our highest priorities. To fulfill this obligation, we're available to answer all questions regarding our selection of floor tiles or if you need design advice from our experts. Whatever your situation, we'll do everything in our power to help you make the best decision for your home. When investing in something like flooring, you want to make sure you are completely confident in your decision. We understand that no homeowner wants to feel limited in a lasting choice like tile flooring. With an extensive selection of tiles, including materials like ceramic and porcelain, you can count on us to make sure your every flooring need is satisfied. By backing our products with wear, fade, and stain warranties that last up to 25 years, you can't go wrong by choosing us! In addition, we utilize an exclusive rating system that helps you decide what flooring works best for your way of life. The solution to your tile flooring in Ankeny, IA, is finally here now that you've found our great selection at affordable prices. Contact us to see our showroom today to see what we have to offer. We look forward to serving our valued customers throughout Ankeny, Saylorville, Bondurant, Altoona, & Elkhart, Iowa.